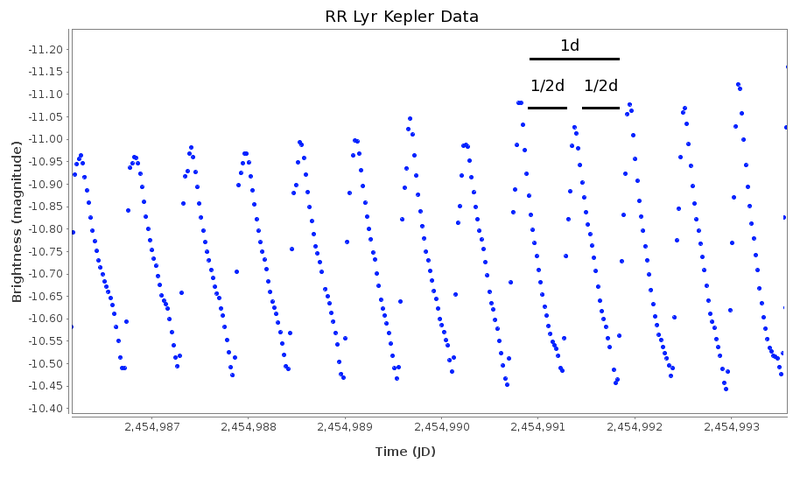 Three close-up sections of the Kepler light curve of RR Lyr at the same phase of the Blazhko-modulation. In each case the amplitude of the pulsation is increasing because of the Blazhko modulation. Theses sections are part of a 127-day long Kepler lightcurve. In the leftmost two sections of the panel adjacent maxima sometimes differ by as much as 0.10 mag. But the effect of period-doubling is not always evident (as seen in the rightmost panel. (From Szabo et al, 2010 - used with permission). I'd like to thank the AAVSO for inviting me to be the third Janet A. Mattei Research Fellow. I'd also like to thank Katrien Kolenberg and Robert Szabo for deciding to visit AAVSO headquarters despite the 40 deg C heat at the time. While I was aware of the period-doubling of some RR Lyrae stars from Kepler, their visit and my subsequent attendance at Robert's talk at CfA galvanized me to write about their work. In the words of George Peppard of the "A Team" - "I love it when a plan comes together."